Finally, Samsung has started giving the update for Galaxy A8 for some of his variants. The Mid-ranger Galaxy A8 is currently receiving Marshmallow update in India, but soon be available in other countries as well. After updating Galaxy A8, you will find a cleaner User Interface, improved battery life and highly enhanced performance of the device. The Samsung Galaxy A8 Marshmallow update brings many new features like new Doze mode, Google now On Tap, granular app permissions, fingerprint sensor and much more. The new update also fixed many inner bugs. Sri Lanka, Taiwan, Kenya, Saudi Arabia and many other countries will soon get an update of Marshmallow for Galaxy A8. Firmware Details of Galaxy A8: Model- SM-A800F, Model Name-Galaxy A8, Country-India, Changelist-8462747, PDA-A800FXXU1BPF5, CSC-A800FODD1BPF4. Check the download section below and we recommended you to use the tool provided there to search update for your device and download the latest firmware file available in the link. Update: Android 6.0.1 Marshmallow comes to SM-A800I but only in Vietnam for now. 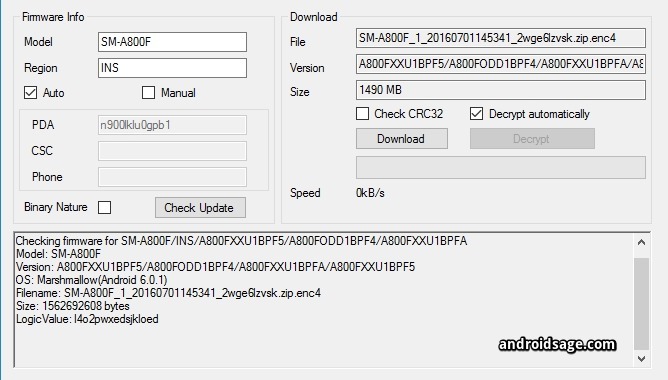 To download without any speed restrictions, download the firmware directly from Samsung servers from the tool provided in the first link (First bulletin). Otherwise, download it from third party website from the links given below. How to Update Galaxy A8 To Android 6.0.1 Marshmallow via Odin? Odin method is the easiest and most used method to update Samsung smartphones. Full firmware files will comfortably install while using this method. So, download firmware files of your choice from the above download section and use Odin installation instructions for Samsung devices from here: Procedure to install Android 6.0.1 Marshmallow using Odin. Follow and like us on social media. For any queries, comment below or leave us a message in the forum. When is d update to marshmallow scheduled to come for SM-A800I in India ? Right now SM-A800I update comes for Vietnam users and will soon be getting an update for Indian users too. As soon as an update will come, we will update that on our website. Only available in Vietnam for now. It will soon be available in India for A800I. Meanwhile you can checkout the SamFirm tool listed in the tutorial to get the latest available firmware. Still no updates for A800I?? No. Till now no updates for A800I is available. Hi Sreenivasa. The update comes to A800I, but only available in Vietnam. Still no update for the A800yz???? so this 6.0 will work on a8000??? Previous Entry How to Install Stock TouchWiz Firmware on Samsung Galaxy Device With Odin?